Coming up this weekend, July 20-22, 2018, Northern Nights Music Festival will kick off a 3-day one-of-a-kind festival experience blending cannabis history, education, and entertainment located on the Humboldt and Mendocino County Line, the epicenter of the Emerald Triangle. 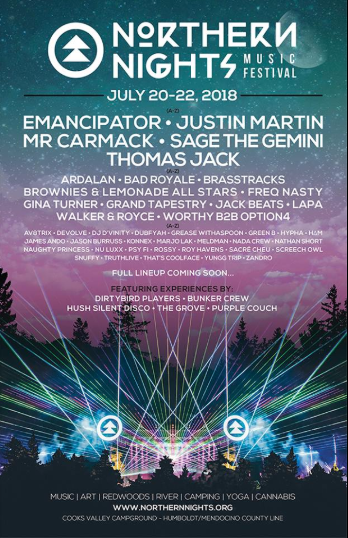 With a diverse lineup of artists and a Friday night takeover by Bay Area’s beloved Dirtybird Records, the new festival is also bringing cannabis culture into its grounds, having teamed up with “dozens of California-based dispensaries and local Humboldt farms to expand on the existing Cannabis history programming, which will take place in two select areas: NN Tree Lounge and VIP”. Calling all cannabis enthusiasts out there, NNFM created the NN Tree Lounge, debuted in 2016, as “the first-ever official designated area for on-site consumption of medical marijuana at a music and art festival in California.” As part of their immersive program, Northern Nights’ mission to include local business and agricultural community into the festival, allows them to give back to their best supporters. This year, participating brands include Humboldt’s Finest Raw & Uncut,​ General Extractions, Madrone California,Guild Extracts, Humboldt Brothers, Talking Trees, Rising Source, Filigreen, and Rise Logistics.